PEX (or cross-linked polyethylene) is a type of plastic tubing widely used for radiant floor heating and for all plumbing applications. Although relatively new to the USA (it has been around since the 1990’s), it has been installed in Europe for more than 30 years. It is growing in popularity due to the increased reliability, ease of installation and lower costs for the material than copper piping. While copper pipe when frozen will split when the frozen water inside expands, PEX (also known as XLPE) allows enough expansion that it can withstand frozen cycles. This is especially important when installing piping in a slab for radiant floor heat when the slab may be exposed to freezing conditions during construction, or when your log home serves as a vacation home and may be uninhabited during the winter months, such as a small cabin built off the grid. 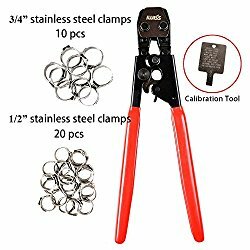 This tubing is easier than CPVC to install because it comes in a long roll and is threaded through drilled holes and around corners as a single long piece. CPVC, on the other hand, must be cut and fitted, creating dozens of potential leaks at every joint. PEX-a is strong, uniform, and very flexible. It is made using the Engel method. PEX-b is also very flexible, strong and uniform. It differs only in the style of manufacturing, using the Silane method. PEX-c is the most environmentally-friendly method of the three, and it is made using the electronic beam method. 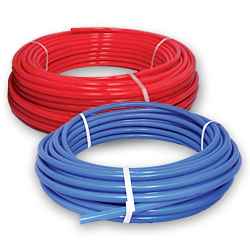 The tubing comes in blue and red colors to distinguish between cold and hot water installations, and it is available in sizes from ¼” to 4”, although the most commonly-used sizes are ½” and ¾”, especially for radiant floor heating applications. XLPE is ideal for use in radiant floor heating or hydronic systems, as it can withstand water temperatures as high as 200° F. When using tubing for radiant floor heating it is best to use an XLPE type of PEX that contains an oxygen barrier to prevent some of the ferrous system components from rusting. Cross-linked polyethylene piping also comes in coils ranging from 100' to 2000' making it very versatile for burying in the concrete slab under your cabin. In radiant floor heat systems, it’s typical to install the tubing in a “home run” system. This means that each area or zone that is heated gets a single length of tubing that runs out from the manifold, around the area to be heated, and back to the central manifold. This isolates each area and reduces the chance of both leaks and hot or cold spots in the floor. There are also systems that use a compression fitting to seal the tubing. Cross-linked polyethylene piping is a widely-used, reliable and versatile tubing ideally suited for radiant floor heating and other plumbing applications.